Many of us worry about time. None of us has enough time each day, and many of us think about how much time we have left here on Earth. We try to squeeze in as much work and life as possible into our very limited time, wondering if we’re using it wisely. 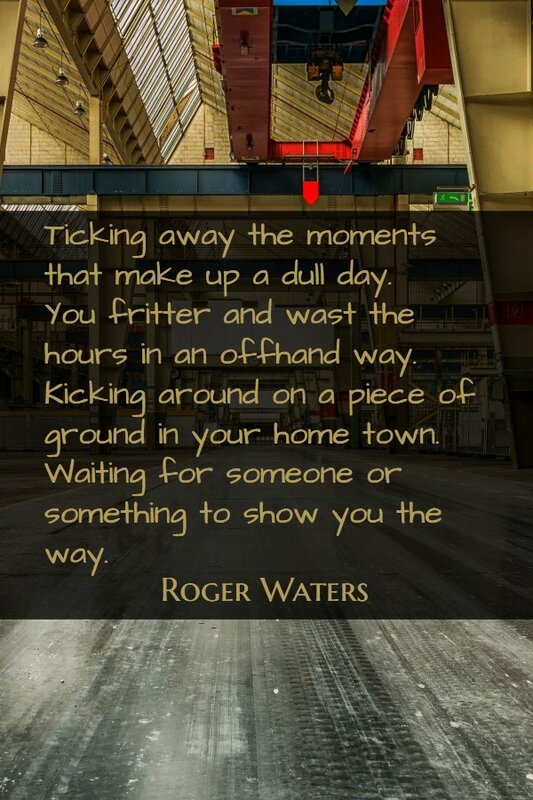 Roger Waters gave us great advice in the meaning of Pink Floyd’s Time. I asked in another post if you ever felt like you’re in the movie Interstellar. Well, do you ever feel like you’re in a Pink Floyd song? Although Pink Floyd was definitely one of those bands my parents didn’t allow me to listen to when I was younger, I found ways to listen to rock ‘n roll any chance I got. My friends loved Pink Floyd, so I’ve heard Time thousands of times. All those years loving the Gilmour’s voice and guitar, but never really noticing Waters’ lyrics. For some reason a couple months ago, those opening lines really sounded an alarm for me much like the alarm at the beginning of the song. Pink Floyd’s Time is the wisest song ever! Let’s dig into the meaning of Pink Floyd’s Time. Here, listen to the song while you read. Or read, then listen. Or just listen. First, I love the alarm! All those clocks. It’s so…alarming. I played those two lines over and over again to make sure that’s what he as really said. That was exactly what I did every day for years. I’d watch the clock, waiting for time to leave work. When it got close enough to time to go, I even watched the second-hand lumber its way around that mocking face the last few times and finally make that tortuous climb up to 12. I spent entire years of days working on boring tasks I didn’t care about, trying to distract myself with junk food and sodas. I seized every possible opportunity with co-workers to complain about the job and bash the company. I’m the one who hated what I did and came back every day for more of the same. Yet, they were the idiots. I wasted all that time blaming the company while filling my head with negativity and my body with junk food. I had to look up offhand. It meant what I thought it meant, but sometimes phrases in the UK don’t mean what they mean in the US. I found this entry for offhand in the Cambridge Dictionary. The Cambridge Dictionary has tabs so you can see translations in British English and American English. I wanted to know what Roger Waters was thinking, and it turns out the definitions are a little different. The American definition does suggest the apathy I expected…”not showing or not done with much thought or consideration”, but the British definition adds a little vinegar. Those are the differences in the use of offhand as an adjective, describing “the way.” The definition as an adverb is more similar. Hey! This isn’t grammar. It’s Rock ‘n Roll! All those hours of all those years wasted in an offhand way. Stop frittering and wasting your hours on grocery shopping! Simplify Shopping with Shopping Made Easy! But this isn’t Independently Regrety (word! ), It’s Independently Happy! I looked for the lesson in a bad situation, and I’m using that 20 years of experience for my new book. 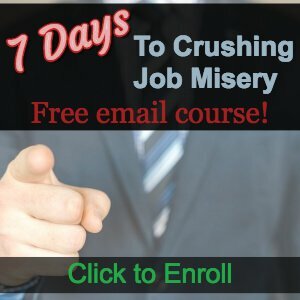 I’ll help people like me survive the daily grind of a job with which they don’t identify. Picture that. A guy wandering around. He’s got his hands in his pockets, staring at the ground, occasionally kicking a small rock from his path. He’s wandering up and down the same streets where he grew up. Living where you grew up can be great! It’s not for me, but it’s not necessarily bad. This guy isn’t happy about it, though. He’s “kicking around.” He’s not skipping or hopping. He’s kicking. Chances are that if you’re in the same situation I’ve been in, you have felt used. I served my purpose, and they paid me for that purpose. The problem is that I didn’t serve a purpose that was important to me. I didn’t go where I wanted to go. That’s why Waters had us kickin’ it in our hometown. We never felt like we went anywhere. Hometown may also mean more than just a location. Maybe “A piece of ground in your hometown” is your comfort zone, a small space that we won’t leave without being told. I think waiting is the central message of the song. We wait for the perfect weather, a later time when life will be more convenient, waiting for someone to tell us when it’s time. We’re even told what will be on the test. Then we graduate from school and enter a life where we are tested every day. Nobody can tell us what’s going to be on that test. We have to decide what to study and what work to do. That works out great for the corporations that need people who need to be told what to do, but what about those of us who want something more? We spend the first 23 years of our life with constant instructions of what to study, down to the very questions on the test. Then we graduate to where there is no one to show us the way, except those who want to show us their way. When we were young, something like lying in the sunshine seemed boring. We got tired of it wanted to do something else. There was plenty of time to waste, so we’d spent time at home doing nothing. The weather didn’t matter. Sunny or rain, we were bored and waiting for something better. Now, though. How great would it be to just lay down on a beach or in a field, in the sun and just do nothing? How diverting would it be to just stay home on a rainy day and read a book or just sit and watch the rain? It would take me a couple days to get tired of either. …and life is long. When we were young, we thought had all the time in the world. As children wanting to be teens, being a teenager seems so far away. When we were teens and wanted to be an adult, being an adult seemed so far away. Waiting for something you want makes it seems forever away. The time that’s passed seems to be moving so fast. 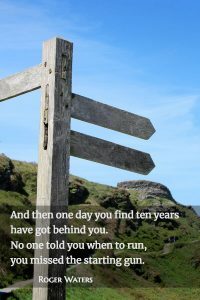 I often quote Gretchen Rubin, “The days are long but the years are short.” Along those same lines… The future is slow, but the past is fast. Check out Time Flies so Fast! How does time get away from you? Gradually, then suddenly. This happened to me not very long ago. 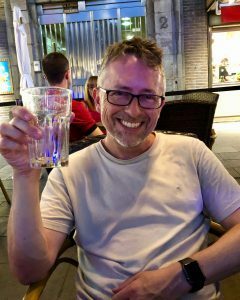 When the company laid off several colleagues and I was left, I looked back to when I originally started hoping to someday get a severance package. It was a little over nine years before when a friend and I talked about it. That friend has moved on to a few different jobs. He’s self-employed and having the time of his life. And there I was, still waiting almost ten years later. The Groucho quote was just for a quick laugh. I think this affects Gen X and maybe baby boomers more than younger generations. I think younger generations are more accustomed to not being told. Even if you want to work for someone else. They’re going to value you more if you don’t have to be told what to do. Those middle management types love initiative that benefits their careers. Somehow we learn to wait until we’re told, though. We don’t have to wait for a starting gun. We don’t have to wait to be told when it’s okay to move. Ten years later, it feels like we missed the chance. We let it slip slide away. The starting gun fires every day, but we still feel like we missed it. Until we realize that we can start at any time, all the time. Then the choir mourns along while Gilmour’s guitar wails in the agony of realizing those years were wasted. Then there are the chasers. The ones that chase too many opportunities, every distraction. Always looking for answers outside themselves. Chasers spend every day running after something, not appreciating anything and ultimately not enjoying any of the days that pass. We chase fleeting things, running in circles and not knowing the days are passing. Never grateful or mindful. Always running. And those little screens. It’s as if Roger Waters new we’d all carry around these little, sinking suns that would consume all our attention. He’s talking about mobile devices. The days get away from us. Waters didn’t mention a sunset or a sunrise. The sun sinks, like something thrown away, something that perishes. Then it sneaks up behind you. The day passes, catching you off guard. The sun doesn’t change. The days all seem the same. The all run together with no novelty or variety to distinguish one from the other. And while those days pass, seemingly unchanging, we are changing. We’re getting older. Although it seems like he’s just saying our remaining days are fewer, I think Waters is speaking of our waning energy level as we age. Wow, this song is depressing so far! I don’t think he’s saying our age is causing our lack of energy, though. I think he means that our boredom and regret are zapping our energy. I bet Roger Waters is also a Gretchen Rubin fan! He told us back in 73 that years are short. We all know what that’s like. As we get older, the years seem shorter. The past is fast. Procrastination. We never seem to find the time. We’re young, life is long, we’ll have plenty of time for those things we want to do. We just can’t find the time now when we’re chasing a sinking sun and distracting ourselves to pass dull days. Okay, now let’s pour a little regret on the wounds. 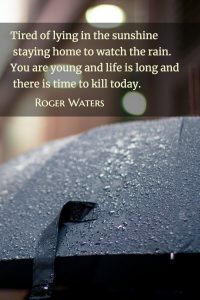 Thanks, Roger! Why don’t you go ahead and bring up all those things we didn’t do? All those plans for nothing because we never took action. Yeah, thanks, Rog! Then Rogers takes us to the end. “The song is over,” but we had more to say and so much more to do. I think the last part of the song is a reprise of an earlier song “Breathe.” I don’t think Rogers wrote it as part of Time. Don’t be that guy in a Pink Floyd song. Get out there and do things, your things, not the things that you’re told things. Life isn’t a race. There’s no starting gun, just starting or not starting. We’re not here to wait to be told. If life has any purpose, it’s living.